sql.sasquatch: CREATE INDEX sort_in_tempdb - test model for sort/hash spill stress? CREATE INDEX sort_in_tempdb - test model for sort/hash spill stress? 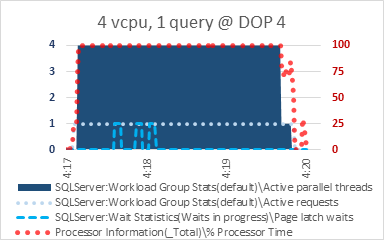 The 4 parallel threads (the dark blue area) are keeping the vcpu at 100% cpu busy (the red dots). The CREATE INDEX is the only active request in the default workload group (the really light blue dots), and there are no other workload groups except the internal group. Perfmon was collecting metrics in 1 second intervals. Notice that it caught a task waiting for a page latch for a few seconds!! (That's the light blue dashed line.) But - that waiter was at a time of reported 100% vcpu utilization. Any optimization that removed that wait with no other changes would simply see the time replaced with signal wait or sos_suspend_queue time. Well... how about query memory and tempdb usage? 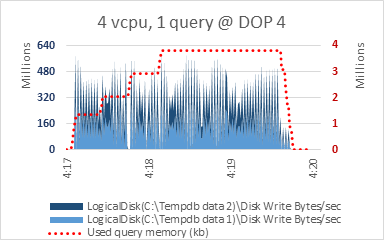 The query received and used a memory grant of almost 4 GB, which it used in a step function manner as seen in red dotted line below. The one second perfmon collection interval really shows the microburst nature of this tempdb activity. Those one second burst are up to 500 mb/sec. That type of write throughput can be really punishing to shared storage. Let's take a look at the tempdb footprint during this CREATE INDEX. The bursts of writes leads to pretty steady tempdb footprint growth throughout the activity. 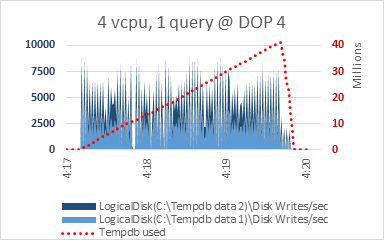 Now, my working assumption is that sort_in_tempdb has the same potential allocation page bottleneck as sort and hash spill, and ultimately the same as the allocation page contention that we know and love from systems with session counts many times the (v)cpu count putting pressure on lots of temp tables with create/destroy/populate. 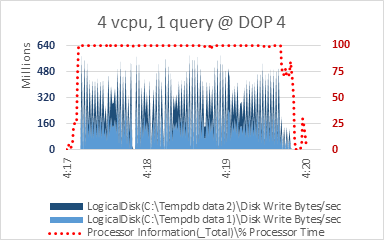 But on these systems the target for query concurrency is typically 2 to 3 times vcpu count, with a MAXDOP no higher than 8. Of the queries running, only 2 to 4 are expected to spill concurrently at any given time. There is no significant contending concurrent use of #temp or ##globaltemp tables among the concurrent queries. For now its off to check on resources for a larger scale run of this test - with single command at high DOP and mulitple concurrent commands at lower DOP to see how the waiters, CPU utilization, and write activity play out.